Learning about the different manatee species is a great way to understand their similarities as well as their differences. 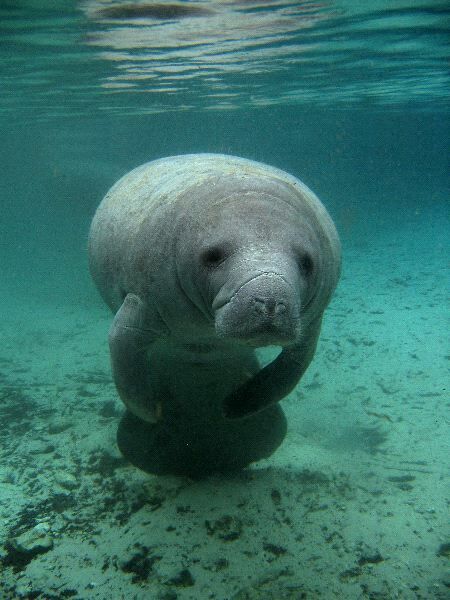 All manatee are very large and they can weigh up to 1,200 pounds. The females are larger than the males but other than that they are very similar in how they look. They can be up to 14 feet long depending on the species and the location. The manatee has a round snout and a paddle like tail. They have a round body that has wrinkles in it. They are able to use their senses to help them do very well. This includes hearing, smell, and vision. They are very good with communication and touch is a big part of their survival. They are often heard making whistling and clicking sounds. They are also often seen touching including using their flippers to be able to embrace the same way that humans do when they hug each other. The manatee is very gentle in nature, and they aren’t a harm to humans. Yet they may get themselves into trouble if they get too close to fishing boats or nets. This has accounted for large numbers of injuries and deaths. Other issues in the water such as pollution and disease have resulted in their numbers decreasing. The African Manatee is the species that the least is known about. They live in many rivers and even the oceans around Africa. They can live in clear or murky water. They can live in fresh or salt water. However, they do need to have access to fresh water for drinking. They tend to live in the shallower regions. They also seem to move at a slower pace than the other species of manatees. While they are average in terms of overall length compared to other species, they are on the smaller size when it comes to weight. The largest species is the West Indian Manatee. They are found around the West Indies and into the Caribbean. There is also a subspecies group that is very large around Florida. They have very low metabolism and less body fat than other species. As a result, these manatee have to stay in water that is warm. They can live in either fresh or salt water and even murky waters. However, they need to have access to fresh water for drinking on a regular basis. They are very active and highly social. They spend a great deal of their time playing games and interacting with each other. It can be fun to watch them, and along the coast of Florida is a prime tourist area where people come to do just that on a daily basis. The Amazonian Manatee is found in the Amazon Basin. They live in various types of rivers and often in murky waters. They are able to move into larger connecting rivers though during the dry season so that they don’t get stuck in the mud. They also have a metabolism that is slower than other species. As a result, they are able to fast for several months during the dry season if food supplies are hard to come by. All species of the manatee are a concern right now due to low numbers that continue to drop. There are conservation programs in place to help protect them. This includes laws to prevent harming or hunting them. Trying to get those laws strictfully enforced though has proven to be part of the difficulties. Still, education and proactive actions have helped to make this a cause that many are interested in donating their time and money for.